To Cite: Lashkaripour M, Adibi A, Farajian Mashhadi F, Dashipour A. Modafinil for Treatment of amphetamine/ Methamphetamine Dependence: The Randomized Double - Blined ClinicaL Trial, Int J High Risk Behav Addict. 2017 ; 6(2):e37660. doi: 10.5812/ijhrba.37660. Background: Using methamphetamine and its dependence is a serious public health problem worldwide. In Iran about 50% of hospital beds are occupied due to psychosis or mental disorder complications related to methamphetamine dependence, which seriously affects patients’ admission to psychiatric hospitals. Objectives: The current study aimed to evaluate the effectiveness of modafinil for treating patients with amphetamine dependence. 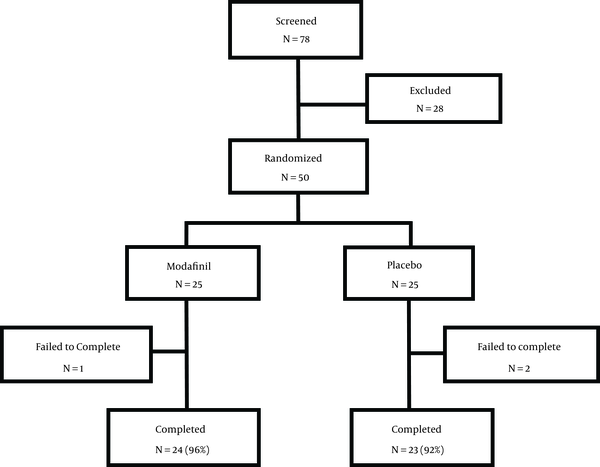 Patients and Methods: In the current clinical trial study, 50 male patients with amphetamine and methamphetamine dependence, who had referred to addiction treatment clinic of Baharan psychiatry hospital in Zahedan, Eastern Iran, were studied. The participants were followed for 12 weeks. The random sampling method was used and patients were divided to two groups of modafinil receivers and placebo, based on blocks permutation. To evaluate the consumption of amphetamine/methamphetamine, urinary screening for methamphetamine was conducted in the beginning of the study and every week during the study period. The drug craving and level of dependence were measured by Visual Analogue Scale of Craving (VAS) and Addiction Severity Index (ASI), respectively. At the end of the follow-up period, data were analyzed using t-test and Chi-square test by SPSS ver. 18. Results: The mean age of the subjects was 29.5 ± 6.4 years. The results of urinary screening for methamphetamine were positive for 52.8% and 55.1% of the subjects in the modafinil receivers and placebo groups, respectively. The mean scores of drug craving were 76.2 ± 9.0 and 81.0 ± 8.2 for the modafinil receivers and placebo groups, respectively (P = 0.064). The mean of reduction in dependence level scores were 5.6 ± 2.7 and 2.0 ± 1.1 for the modafinil receivers and placebo groups, respectively (P = 0.001). Conclusions: The results of the current study showed that modafinil was well-tolerated but not effective in reducing the level of consumption (number of negative urinary tests for amphetamine-methamphetamine). Modafinil was effective in reduction of severity addiction to amphetamine-methamphetamine. Methamphetamine is a highly addictive psycho stimulant that affects the monoamine neurotransmitter system (1), and increases the level of catecholamine such as dopamine, which affects consciousness (2). Methamphetamine abuse and dependence is a serious public health problem worldwide, which affects wide spectrum of the society and imposes heavy medical and psychiatric costs on the community. Eastern and South-Eastern Asia and Australia, West and Middle-West of America and some regions of Britain are seriously affected by these problems. Almost 8% of hospitalized patients are admitted for addiction treatment programs regarding addiction to stimulants or methamphetamine abuse (3). Methamphetamine, after marijuana, is the world’s second most used illegal substance that also has raised new health care concerns in Iran (4). In Iran, about 50% of hospital beds are occupied due to psychosis or mental disorder complications resulted from methamphetamine addiction, which seriously affect psychiatric hospital wards atmosphere (3). The study conducted by Lashkaripour et al. (5) reported that the level of methamphetamine consumption in patients referred to addiction treatment clinic of Baharan psychiatric hospital in Zahedan increased from 6% in 2009 to 20% in 2011. Methamphetamine is a potent form of amphetamine, delivered by inhalation, smoking, intravenous injection or oral delivery (3). The adverse psychological effects of this substance could be continued hours after consumption. Methamphetamine leaves its premium effect through releasing catecholamine (especially dopamine) from presynaptic terminals. These effects are specifically potent for dopaminergic neurons drawn from ventral tegmental area to the cerebral cortex and the limbic area. This pathway is called the “reward pathway” and its function is probably the main addictive mechanism of amphetamines (6). Drug craving is the main core of drug consumption. The short-term effects of drug consumption are: increased level of energy, general feeling of well-being, euphoria, increased level of self-confidence and improvement of mental and physical performances, which lasts for six to eight hours (7). At high doses, toxicity symptoms are restlessness, insomnia, agitation, impairment in judgment, impulsive and potentially dangerous sexual behavior, aggression, increased psychomotor activity, hyperthermia and probably seizure (7). Long-term consumption of methamphetamine may lead to addiction, mood disturbances, paranoia, agitation, psychosis, cognitive disorder (8), toxicity and death (3, 9). In the recent years, the prevalence of toxicity with drugs and psychotropic substances, such as amphetamines, has increased among young people (6, 10). Abstinence of methamphetamine after long and continuous term of consumption results in dysphoric syndrome, feeling weak, inability and lethargy, anxiety, nightmare and sleep disturbances, headache, profuse sweating, muscle and stomach cramps, and increased appetite in patients (6, 11). The withdrawal symptoms reach their peak in two to four days and decline in a week. The most serious withdrawal symptom is depression, which may be accompanied by suicidal thoughts and behaviors (7). The fact that there is no acceptable medical therapeutics for many symptoms of methamphetamine consumption, may be due to lack of knowledge regarding underlying cellular and molecular mechanisms inducing psychosis that result from addiction and dependence on methamphetamine (9). Development in methamphetamine pharmacotherapy is still in its early stages and no clear evidence of treatment effectiveness is observed (3, 12). New studies have been conducted on the effectiveness of modafinil to treat amphetamine dependence (13-16), and some studies reported the effectiveness of this substance to treat patients addicted to amphetamine and methamphetamine (13-15). Modafinil contains alpha-1 adrenergic properties and increases the level of awareness, but is chemically and pharmacologically different from stimulants of the central nervous system (CNS); however, its exact mechanism of action is still unknown. There are several reasons for use of modafinil to treat methamphetamine dependence. These reasons are as follows; stimulant properties of modafinil could be therapeutic for alleviating some stimulant withdrawal symptoms, could be used to attenuate reinstatement of metamphetamine self-administration in animal testing, has lower abuse potential than methylphenidate or amphetamine, improves cognition and mood, and it has been used in trials of treatment for cocaine dependence and proved to be safe and well tolerated in almost all studies (13). Modafinil does not cause dependence and is associated with very low incidence of symptoms such as headache, vomiting, anger, anxiety, insomnia, nasal allergic inflammation, diarrhea, backache, dizziness, indigestion, flu, dry mouth and anorexia; most of the patients use it with no problems (13, 15). Some other studies have not confirmed its effectiveness (12). Due to increase in abuse and dependency on amphetamine/metamphetamine, low effectiveness and contradicted of drug treatments of amphetamine dependency in previous researches, and need to more researches for treatment of amphetamine/metaphetamin dependency (3), the current study aimed to evaluate the effect of modafinil on amphetamine dependence treatment. The current double-blinded clinical trial was conducted on 50 male patients, aged 18 to 65 years and addicted to amphetamine or methamphetamine on methadone maintenance treatment (MMT). Patients on MMT with positive urinary amphetamine-methamphetamine test were selected. Patients were assessed for major mental disorders; with the Mini international neuropsychiatric interview (MINI). Then, selected patients were randomly assigned into two groups, based on blocks permutation. First, the aim of the study was clearly explained to all subjects and they signed a written informed consent. The subjects could leave the therapeutic program whenever they wished. Inclusion criteria were Methamphetamine dependency based on diagnostic and statistical manual of mental disorders, 4th edition, text revision (DSM-IV-TR) criteria, male gender, eighteen to sixty five years of age, positive urine test for amphetamine and methamphetamine, no contraindication for the use of modafinil. Exclusion criteria were abuse of different kinds of drugs except for nicotine and methadone, history of any other psychiatric disorders in Axis I except depression, having medical conditions that may interfere with the use of modafinil, having suicidal thoughts and aggression, participating in another study simultaneously, dropout from the current study. The subjects, who did not use drugs for six consecutive doses or showed threatening or aggressive behaviors and had drug overdose were excluded from the study. This study was done on patients aged 18 to 65 years, who were addicted to amphetamine or methamphetamine that referred to Baharan Psychiatry Hospital in Zahedan, Eastern Iran, from 2015 to 2016. Fifty individuals, who met the DSM-IV-TR criteria for methamphetamine dependence, participated in this twelve-week trial. The subjects were randomly divided to two groups including modafinil and placebo. The participants received 200 mg of modafinil or the placebo daily until the end of week 12. Blood pressure monitoring and evaluating the adverse effects were performed weekly. Urinary screening for methamphetamine and drug craving scoring were conducted weekly and at the beginning of the study. Each subject should have had 12 laboratory results for amphetamine-methamphetamine urinary screening and non-co-operation for Amphetamine urinary screen was considered as a positive test. Our primary outcome was methamphetamine craving. To evaluate the level of drug craving, the Visual Analogue Scale of Craving was used and the subjects were asked to score their drug craving level from 0 to 100; 0 was the lowest and 100 was the highest level of drug craving (17). The Addiction Severity Index (ASI) is a structured interview to evaluate the severity of addiction, which assesses medical, occupational, legal and psychological status and also the level of drug used by the patient; higher score means higher levels of addiction severity (18, 19). The questionnaire was completed during weeks zero, six and twelve of the study. To assess subjects for mental disorders, the mini international neuropsychiatric interview (MINI) was used, which contained 16 sections each including a certain number of yes/no questions. Subjects with concurrent diseases were identified by the MINI questionnaire and excluded from the study. The reliability and Cronbach’s alpha coefficients were 0.76 and 0.89, respectively (20). Generation of randomization codes was conducted by permuted randomization blocks using the Excel software. Randomization was performed by an independent person, who was not involved elsewhere in the trial. Concealment of allocation was performed using sequentially numbered, sealed, opaque and stapled envelopes. Separate people were responsible for generation of randomization codes, treatment allocation and interviewing. The patients, research investigators and interviewers were all blinded to the treatment allocation. Modafinil and placebo were completely identical in their size, color, shape, texture and odor. Differences between the groups were reported as mean differences (95% confidence intervals (95% CI)). All analyses were based on the intention-to-treat sample and were performed using the last observation carried forward (LOCF) procedure. Comparison of score change from baseline to end point between the two groups was done using the t-test. P < 0.05 was considered significant. The mean age of the subjects was 29.5 ± 6.4 years. Subjects were evaluated based on their marital and occupational status, with most being married and self-employed. There was no statistical significant difference between the two groups (P > 0.05). It is noteworthy to mention that one participant in modafinil group was excluded from the study on eighth week and two subjects in the placebo group were excluded from the study on seventh week and eight due to simultaneous use of opioid. Hence, the study was completed with 24 and 23 subjects in the intervention and the placebo groups, respectively (Figure 1). Urinary screening for amphetamine/methamphetamine was conducted every week, and 288 and 276 test results were registered for the modafinil and placebo groups. The mean positive urinary screening for the modafinil and the placebo groups were 6.3 ± 1.1 and 6.6±0.8 cases, respectively; no statistical significant difference was observed between these values (P = 0.327) (Table 1 and Figure 2). The mean score for drug craving in the modafinil and the placebo groups were 76.2 ± 9.0 and 81.0 ± 8.2, respectively. The mean score of drug craving in the modafinil group was decreased, which was not statistically significant (P = 0.064) (Table 1 and Figure 3). 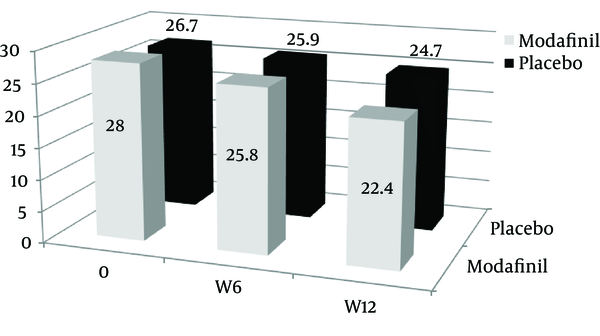 The mean scores of addiction severity between the two groups at the beginning of the study and the sixth and twelfth week were statistically insignificant; but the level of decrease in the addiction severity were 5.6 ± 2.7 and 2.0 ± 1.1 in the modafinil and the placebo groups respectively, with statistically significant differences between them (P = 0.001) (Table 2 and Figures 3 and 4). Since no medical treatment has been approved for amphetamine methamphetamine dependence so far, the current clinical trial aimed to evaluate the effect of modafinil on the treatment of methamphetamine dependence in 50 male patients addicted to amphetamine and methamphetamine. The mean age, marital and occupational statuses of the subjects were similar in the two groups of the study. There was no statistically significant difference in dropout rate between the two groups (one participant in modafinl and two participants in placebo group dropped out). Also, 52.8% and 55.1% of the subjects in the modafinil and placebo groups, respectively, had positive urinary test for methamphetamine; there was a trend of reduction in Modafinil group, however this was not statistically significant. The mean drug craving score for modafinil group was 76.2 ± 9.0, which had a significant decrease compared with that of the placebo group (81.0 ± 8.2), yet the level of decrease was not significant. The mean score of addiction severity significantly decreased in the modafinil group in the last week of the treatment compared with the first week in comparison with the placebo group. The level of decrease in addiction severity in the modafinil and placebo groups were 5.6 ± 2.7 and 2.0 ± 1.1, respectively, which was statistically significant (P = 0.001). The use of amphetamine and methamphetamine was evaluated in subjects through urinary screening for amphetamine/methamphetamine. Results of the urinary tests showed that the level of positive test in the modafinil group was lower than that of the placebo group, but insignificantly. In a similar study by Heinzerling et al. (2010) (14), modafinil 400 mg was used to treat methamphetamine dependence. It was shown that modafinil 400 mg had no effect on decreasing the level of methamphetamine dependence, compared with the control group, which is inconsistent with the results of the current study. Anderson et al. (2012) (13) conducted a similar study on 210 patients in three groups (68 in the control group, 72 in 200-mg modafinil receivers and 70 in 400-mg modafinil receivers) regarding the treatment of methamphetamine dependence using modafinil. Results showed the effectiveness of modafinil on decreasing the number of positive urinary tests. Results of the current study also showed the decrease in the number of positive urinary tests in the modafinil group, but the decrease was insignificant compared with that of the placebo group. Miles et al. (2012) (21) evaluated the effect of methylphenidate on 79 patients addicted to amphetamine/methamphetamine in Finland and New Zealand. The results showed that methylphenidate had no effect on decreasing the number of positive urinary tests, compared with that of the placebo group. The study by Rezaei et al. (1) in Iran reported the effectiveness of this drug on decreasing the number of positive urinary tests, which is compatible with the results of the current study. There is no evidence that the risk of dependence on modafinil is lower than methylphenidate and this drug (methylphenidate) was effective on decreasing the addiction severity index and the drug craving score. In a study by Shearer et al. (2010) (15), eighty patients addicted to methamphetamine were divided to two groups of 200-mg modafinil and the control. Results of this study showed that the number of negative urinary tests in the modafinil group was lower than that of the placebo group. Also, no adverse effect was reported regarding the use of modafinil; results of the study were similar to the current study. There are some evidences about the mechanism of Modafinil. Gonzalez et al. (2014) (22) in Argentina reported the effect of modanifil on the treatment of cognitive impairment caused by methamphetamine, and the revival of intracellular signaling prefrontal cortex in rats. Considering the decrease in drug craving and level of dependence, modafinil showed better results compared with other substances. Since the study was conducted during a short period of 12 weeks and the level of patients’ withdrawal from the study was low, better results may be obtained from longer-term studies. This study had some limitations. The sample size was relatively small and consisted of only males. Larger studies are required to replicate our findings. The effectiveness modafinil beyond 12 weeks of treatment remains unknown. Modafinil is a medicine with no serious adverse effects and is well tolerated by patients. Modafinil could be effective in decreasing the level of drug craving and addiction severity in patients. The present study was approved by the medical research council and financially supported by the Zahedan University of Medical Sciences. The authors wish to thank the medical laboratory personnel of Baharan psychiatry Hospital, Mrs. Nikbakht and Mehrjo and expert clinical psychologists Mrs. Salari and Bahkshi who helped us in the study. Funding/Support: The study was approved by the medical research council and the ethics committee of the Zahedan University of Medical Sciences (letter no. 6755, date: 22.06.2014) and was registered in the Iranian registry of clinical trials (code no. IRCT2014090219009N1).